Wilson tried to contact Camelot right away but was unable to get through till the next morning. 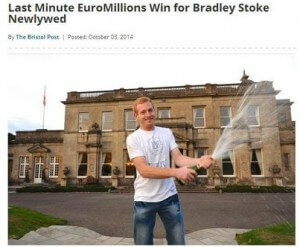 He was relieved to beat the deadline on prize that paid £51,232.90. Now Wilson, who has just recently married, is looking to buy a home of his own, and perhaps buy his wife a new car. He is also considering reviving a career in competitive cycling that he had temporarily given up for lack of funds.